Normally you pay for your highest total expected employee level for the duration you have paid. If you need to upgrade to a higher paid level, you can do so at any time. You can upgrade by moving your expiration date back or you can choose to pay a prorated amount. When you click the link to upgrade on your SETTINGS >Payments page and enter your new expected total, you will see both options on that page. In the top menu, hover over SETTINGS and choose Upgrade to Higher Employee Level. The current number of employees in your account (and any other linked accounts) can be found in the first section. 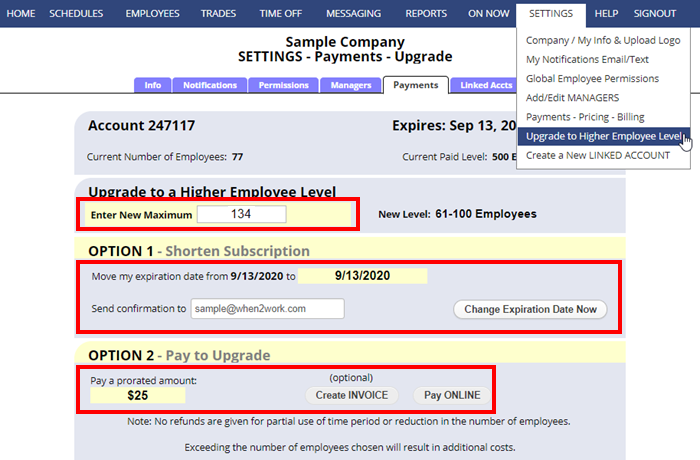 Enter your needed total employees for the duration of your subscription, and you will see the two options update to show the new expiration date or the amount you can pay to upgrade and keep the same expiration date. If you choose Option 1, this will move the expiration date back and send a confirmation email. This is the fasted and easiest option. If you choose Option 2 to Pay Online, the secure online payment form will pop up for you to make the payment.